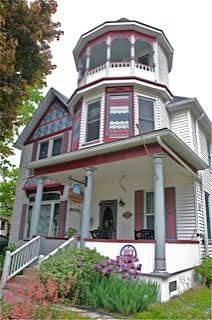 This charming Century-old Victorian home with modern amenities in the heart of Amherstburg has been a popular Biz X and Chamber of Commerce award winning Bed and Breakfast for over a decade. Most of the tourist attractions, galleries and Festival Events are within walking distance. Theme guest bedrooms reflect Amherstburg’s history and our new addition of a Premiere Executive Suite with it’s own private balcony overlooking the the downtown gives the feeling of privacy nestled in a forest of trees. Guests use the Tea Room for the gathering of family and friends or just plain relaxation. Some guests explore and sit on the deck of the Victoria Turret often referred to as a “Widow’s Walk” to watch the ships go by or to enjoy the panoramic view of the downtown, the Kings Navy Yard Park and Detroit River. Many guests find themselves sitting in the Bed and Breakfast’s enchanting garden by the lily pond watching the fish and waterfall. The Bondy House Bed and Breakfast meets the needs of travelers, visiting families and business people wanting an environment that is welcoming and an alternative to the traditional impersonal overnight accommodation. Gift certificates are available, free WiFi is provided and major credit cards are accepted. When you are at The Bondy House Bed and Breakfast, consider yourself at home. Call for more information 519-736-9433.